Elsewhere on this site, you will find the remarkable story of Mierystock Tunnel and the four gentlemen who exhumed its buried northern entrance. It is still their hope that it will eventually host a footpath - a real bonus for walkers who are currently forced to play Russian roulette crossing a major road. And in Bath, those travelling on foot or cycle will soon have the chance to pass through Devonshire Tunnel when one of Sustran’s Connect2 projects unearths its lost portal. Can you see a pattern emerging? 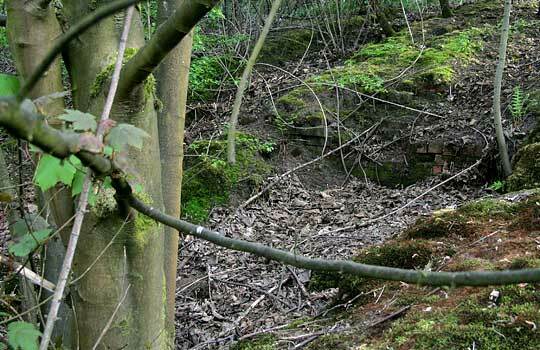 The L&NWR’s Clifton Hall Tunnel, beneath the Manchester suburb of Swinton, was backfilled and abandoned after the tragic collapse of April 1953 that claimed the lives of five people whose homes were on Temple Drive. Soon after, all traces of the structure were cut from the landscape and, today, many of those who reside thereabouts have never heard of it. An 1888 map showing the tunnel's northern approaches. Ray Hulley was a local lad - born and brought up in Radcliffe, just up the line - but now lives in darkest Hertfordshire. In his spare time, he researches lost railways and has been retracing the trackbed of the former Manchester, Clifton Junction and Bury line together with its branch to Eccles, of which the 1,298 yard tunnel formed a considerable part. The scene at the buried northern entrance before Ray's arrival. But any effort to find remains of either portal was unlikely to bear fruit. The southern end is now beneath a playing field; the northern approach cutting was also filled-in, consuming the entrance. However, over the years, occasional ground movements have allowed visitors to catch glimpses of the abandoned structure through the vegetation. Exposed - coping stones at the right-hand end of the portal. 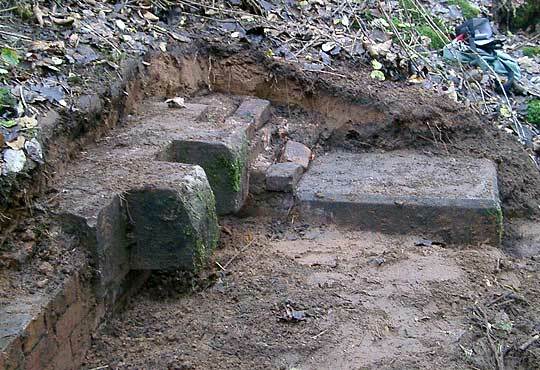 On a recent visit, Ray discovered some brickwork together with a large coping stone. Further exploration uncovered a continuous line of bricks almost 36 feet long. Presuming that this was the buried portal, he exposed the first few rows for confirmation. Clifton Hall Tunnel - at least, a very small part of it - saw the light of day for the first time in almost 50 years. Access to the site is off Ethel Avenue in Pendlebury where a bridge crosses the Manchester-Wigan railway. From its northern end, the path approaches a wooden area, occupying the infilled cutting. If walkers veer to the left and drop down the slope, the portal's remains are on the right before the path levels out. 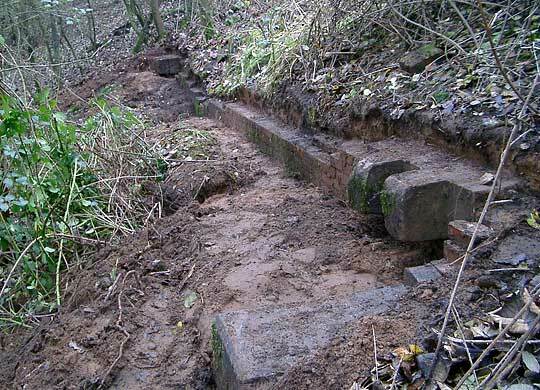 The full section of brickwork - 10.9m (35'8") long - forming the top of the lost portal. This is a favoured spot for local dog walkers and, despite the slippery conditions, is the perfect place for a Sunday afternoon stroll. Wouldn’t it be great if an information board was erected here, reminding those who care to look of a notable chapter in Swinton’s recent history? Whatever its failings, we shouldn’t forget this great work of engineering or those whose lives it claimed. 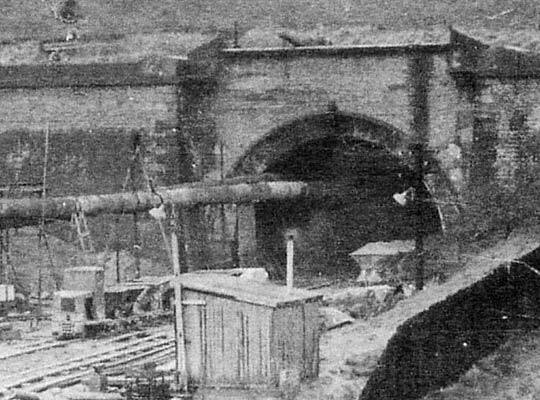 Clifton Hall Tunnel's northern entrance, captured during the Coal Board's infilling works.